The "Inspired by a True Story" subtitle on Dreamer: Inspired by a True Story is completely unnecessary. This is the type of story that is so ooey-gooey that it has to be based on actual events. Dreamer is cheesy, predictable, sentimental, and cliched. And it works. Just because a movie is all of the above things is not necessarily bad. When the movie is decent, like it is here, people can overlook that they know exactly what is going to happen, and that the filmmakers are trying to tug their heartstring, and just sit back and enjoy the movie. There are two stories here, the overt one about a girl's relationship with her horse (who just happens to be really fast), and a subtle, more satisfying one about a family coming back together. It is this second story, nicely woven into the screenplay by writer and first-time director John Gatins (Coach Carter, Hard Ball). It also helps that the talent he has in front of the camera is incredible. Kris Kristofferson (The Jacket, Blade: Trinity) is the family patriarch "Pop" Crane. Kurt Russell (Sky High, Miracle) is his son Ben, and actually looks related. 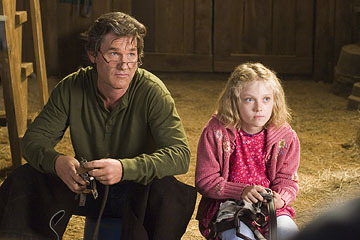 Dakota Fanning (Nine Lives, War of the Worlds) is Ben's daughter Cale. Elisabeth Shue (Hide and Seek, Mysterious Skin) is Ben's wife Lily, but she has little to do except walk around in pajamas or a waitress uniform. The movie belongs to the understated performances by Kristofferson and Russell, and an emotional, energetic one from Fanning. The Cranes once had a large horse farm in Kentucky. Something happened in the past, and Pop no longer cares for horses or speaks to Ben. Ben had to sell off most of the land, and now works for Palmer (David Morse, Hearts in Atlantis, Proof of Life). Cale goes with him to work one day only to witness a promising filly break her leg. Palmer insists on putting her down, but Ben, not wanting to shock Cale, insists that she live. Palmer fires him. Ben takes Sonador, aka Sonja, home, thinking he can fix her leg and later charge for stud fees. Cale now thinks of Sonja as a pet. Ben does not want Cale to enter any aspect of the horse business. Yet, the more time they spend together, the more he realizes that she has a knack for it. Sonja also draws Pop out of his shell, prompting the eventual reconciliation between him and Ben. And even better. Sonja's leg heals, and Cale wants to train her to race again. Helping her train are Ben's friends/coworkers Balon (Luis Guzman, Waiting..., Lemony Snicket's A Series of Unfortunate Events) and Manolin (Freddy Rodriguez, Chasing Papi, Payback). They are all a bunch of underdogs with no chance whatsoever. Yet, Cale has a dream, and she truly believes that Sonja can do good things. Nobody believes in them. Nothing about Dreamer is original, yet Gatins does not stoop to the level of sappy. Russell, Kristofferson, Fanning, and Guzman all give genuine, earnest performances, without overplaying the emotions. The story is simple, and effective enough to keep little girls on the verge of happy tears from the second half to the end. 1 hour, 38 minutes, Rated PG for brief mild language.